Want to see our mounted orchid selection? Select KEIKES are also featured on the stem prop page!! Phalaenopsis Clones , Phalaenopsis Seedlings, Species, Neofinetia, Renanthera, Ascocentrum, Ascocenda, and Vanda Orchids. You may click on thumbnail images to see enlarged photos. The inventory of Phals changes very quickly in our greenhouse. New exciting things can be seen everyday in the greenhouse and it is impossible for me to keep up with them on the web site, so if in doubt or have a special request, please inquire. Note that the use of the genus name Doritis and it's hybrids, Doritaenopsis is no longer valid although you can still find it's use in current references. One of the most ladylike Phalaenopsis. Background color is bright white. Petal edges and lip have dramatic raspberry pink markings and margins. Since one parent is striped, candystriping can occur at times. Flowers, near perfect in shape and form. 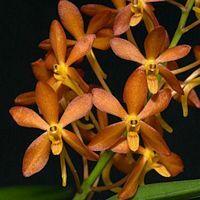 Awarded September 23, 2006, we cloned this magnificent species with long lasting waxy flowers that are highly fragrant. Pendent flower stems are produced between the leaves and should be allowed to hang. These are currently grown in 4 inch plastic grower pots but can be easily transferred to basket culture. Grow warm and keep moist. (Species Orchid) Awarded clones. Seagrove exclusive. When 'Mary Alison' was awarded it held 13 blooms on one inflorescence. Background color is best described as pale green. Very striking. Limited! Award photo used with James Harris permission. A beautiful example of an albino orchid species. 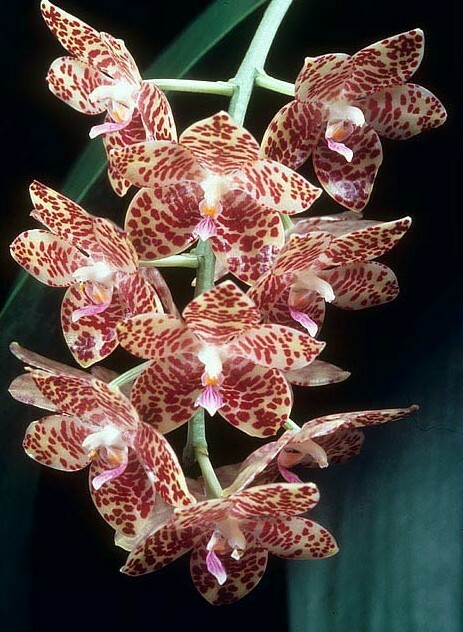 Phal violacea is native to Malaya peninsula and the Indonesian island of Sumatra at elevations around 150 meters. Grow warm for fastest growth and beautiful leaves. Although considered albino Phalaenopsis violacea alba can show a fair amount of green pigment at petal tips. Wonderfully fragrant. Provide lower light levels and even moisture. Phalaenopsis violacea produce evergreen flower stems, so do not cut off stems after bloomings. Each stem can produce flowers for near 8 years each. A new edition to the Vandaceous plant offerings. These little miniatures are bloom size and look like Neofinetia in growth habit and size. The Neofinetia falcata armani island strain has larger flowers than the most commonly seen variety of Neofinetia falcata. Orange to yellow orange blooms are predicted on a plant that will stay petite and manageable. Some have bloomed pink. Perfect windowsill grower choice or for a grower that favors the miniature orchids. Two petite growing Vandaceous parents crossed together to produce a frequent blooming most interesting colorful hybrid. Flowers will range from yellow background to sunset tones. Various spotting is a possibility. Lip colors should be a dramtic contrast to flower color in ranges of hot pink to dark ruby red. Established in wooden baskets. Bloom size Fall bloomers. Large 4 inch across blooms are held on sturdy stems. Looks similar to the Robert's Delight above but blooms are magenta pink. 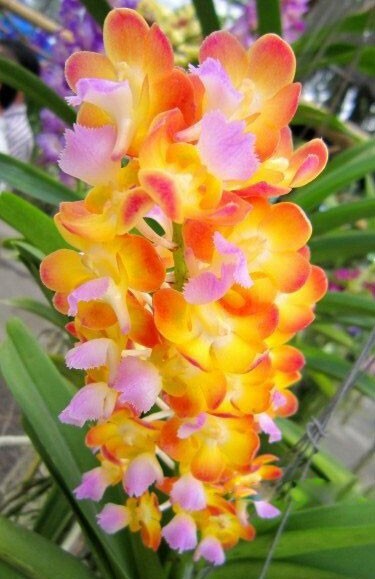 We have many varieties of Vanda and Vanda hybrids. Please do not hesitate to send an email with requests. I will try hard to update the Vanda lsiting, but it will be a long process.